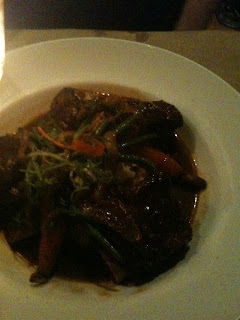 We found ourselves once again in the West Village last weekend starving for some good food but without a reservation. We tried a couple places but all of them had long waits until we stumbled across Agave. There was quite a long line at the front but we were still able to get a nice two person table in the back. I was surprised to see how nice the back dining room was. The low lighting gave it an elegant feel while the music and paintings lended themselves to a party atmosphere. To start we both ordered some Margaritas. They were out of the Prickly Pear so I went for the classic Strawberry. 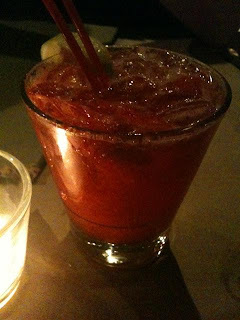 The margarita was great with huge chunks of fresh strawberry puree and just the right amount of tequila. Mr. T got a regular margarita which was a little less sweet but just as tasty. 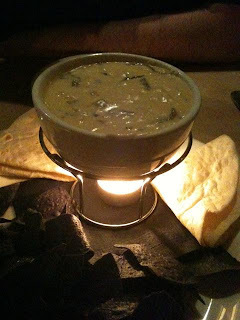 To start we ordered the Blue Crab Spinach Dip and Tortilla Bowl. I didn’t really care for this dip. To me it tasted more like a cheesy clam chowder than anything else. But Mr. T liked the option of having soft tortillas for dipping and we ended up finishing most of the bowl. Okay- Agave is really dark so excuse the next pictures. I tried my best. 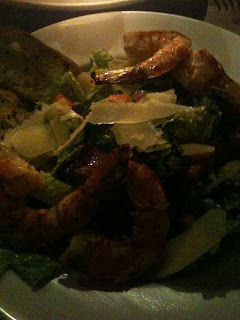 For my main course I got the Grilled Shrimp Cesar salad. First of all, I asked for the small but this salad was huge!!! Big, luscious pieces of grilled shrimp atop romaine lettuce, fresh parmesan cheese and a truly delicious creamy dressing. This was a great Cesar salad. Mr. T got the Beef Short Rib in Mole sauce which was also delicious. The short rib was incredibly moist and the mole sauce gave it a rich earthy flavor that made this quite a decadent dish. We were both way to full for dessert so we got the check. For an appetizer, two main courses and two tequilas the bill was around $80 total. Not exactly cheap but not exactly expensive either. I really enjoyed my meal at Agave. I’ve heard it can be sort of hit or miss but we must have got it on a good night because I can’t wait to get back. I heard they have $5 margarita’s at Happy Hour Monday- Friday. Sounds good to me!